Steelhead Fishery in Ohio Lake Erie Tributaries Better Than Ever! Steelhead were first stocked in Lake Erie in the 1880’s from the McCloud River in California. However, these fish were introduced into Sandusky Bay, which was completely unsuitable because it is too shallow and too warm in the summer. Little was known about the needs of steelhead in the Great Lakes at that time and these early stockings failed. The modern era of stocking salmonids in Ohio began in 1975 when Coho, Chinook salmon and rainbow trout were stocked in the Rocky and Chagrin Rivers. Salmon stocking in Michigan had been quite successful, with fish feeding aggressively in Lakes Michigan and Huron on the abundant alewives, a bait fish that had entered the Great Lakes via the St. Lawrence Seaway. However, salmon were never that successful when stocked in the Lake Erie tributaries and had a poor return. During the 1980’s, Ohio shifted stocking to steelhead. At first the “London strain” was used, a domestic strain raised in the London, Ohio, hatchery. These had adequate returns, but higher success rates and much better returns were obtained when the Michigan “Little Manistee” strain was used. In 1996, all Ohio stocking was shifted to these wild steelhead hatched from eggs taken from fish entering the Little Manistee River from Lake Michigan. Since then, the program has had considerable success. Stocking of steelhead in Lake Erie is done per agreement among the surrounding states (NY, PA, OH and MI) and Ontario. This is overseen by the Great Lakes Fishery Committee which coordinates Fishery Management Goals and Objectives for the state. Of the 1.9 million steelhead smolt stocked annually in Lake Erie tributaries, 58% are from PA hatcheries. Since the late 1990s Ohio has stocked over 400,000 annually from its Castalia hatchery – about 25% of the total stocked in Lake Erie. These are placed in the Vermillion (55,000), the Rocky, Chagrin, and Grand Rivers (90,000 each), and the Conneaut Creek (75,000). About 14% of the total stocked in Lake Erie come from New York, with the remaining 3% from Ontario and Michigan. The numbers stocked annually by each state/province probably will not change significantly in the near future because hatchery programs are at or near full efficiency and there is an adequate forage (bait) fish base to support this stocking and native predators. Until more hard data are obtained on the biology of the fishery, there is reluctance to alter stocking programs. Mixing of fish stocked by various states occurs in Lake Erie, but specifics about stocked fish movements in the open lake are relatively unknown. Recently, techniques have been developed that enable fisheries biologists to determine the hatchery origin of individual fish. A small bone in the inner ear, called the otolith, has a chemical signature that can reveal the fish’s origin. Ohio DNR has evidence that most steelhead in Ohio tributaries in the fall are Ohio fish. However, some come from PA and others from as far away as NY and those stocked in the Huron River of Michigan. Further use of this technique may allow much more to be learned about where fish stocked by various states live in the lake and where they make their spawning runs. Originally, half the steelhead obtained from MI each year were from eggs with the other half from fingerlings. ODNR recently constructed a totally new steelhead hatching facility in Castalia, Ohio, which became fully operational in 2012. Now all steelhead are raised from fertilized ‘Little Manistee’ eggs obtained from Michigan. Research has shown that the best return comes from juvenile steelhead 7-9 inches long stocked in the spring (12-15 months from hatching) in the last few river miles from the river mouth. This approach has led to a consistent number of fish returning each year, not the wide variability of previous approaches. Long-term, capability may be developed to strip eggs from Ohio steelhead and produce our own eggs, but at present that is not a high priority. Very little natural reproduction of Lake Erie steelhead takes place in tributary streams. There are 24 watersheds in the Lake, and limited natural reproduction takes place annually in only four of these. In New York, natural reproduction may account for up to 25% of the run. 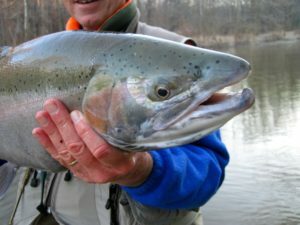 In Ohio, a tributary of Conneaut Creek consistently produces some steelhead. Some reproduction takes place in other tributary streams in some years depending on conditions. Natural reproduction is limited throughout the Lake Erie tributary system because streams are highly variable in water quality, warm temperatures and low flow rates during the summer months; also stream bottoms are mostly shale bedrock, with limited gravel beds needed for egg laying and hatching. Lake Erie is composed of three distinct basins. The Western Basin, located north of western Ohio and containing the Lake Erie islands, is shallow (15-40ft) and well adapted to warm-water fish like walleye and yellow perch. Few steelhead live in these waters. The Central Basin, located off Cleveland and northeast Ohio is a much deeper bowl (50-100ft) and is the primary home of the steelhead stocked in OH tributary streams. The Eastern Basin, a deep bowl located off PA and NY, is separated from the Central Basin by a long, shallow arm that extends from Canada almost to the southern shore. This divides the two and limits the movement of steelhead between basins, although some movement does occur. Most fish stocked by PA and NY live in the Eastern Basin, however little is known about how much mixing of the stocks occur. In Lake Erie, steelhead live in 40-60ft of water in mid-summer, but are found in shallower water during spring and fall when temperatures cool. Because there is so much forage in Lake Erie for all types of fish, steelhead and walleye do not appear to compete with each other and are coexisting well. Although the Lake Erie charter boat fishing industry has primarily targeted walleye and perch, in the last decade there has been some increased interest in targeting steelhead. This will not likely have significant effect on the steelhead stream fishery because there are plenty of game fish and most charter boats are likely to remain focused on walleye and yellow perch. Interestingly, charter catches of steelhead are providing plenty of carcasses for ODNR researchers to examine and get a better idea of the age profile of steelhead in Lake Erie, their feeding preferences and survival rates. Data from this source has made clear that steelhead in Lake Erie are eating, growing and surviving quite well. It is a very healthy population. Growth rates for steelhead are about the same in all parts of Lake Erie. The average length of steelhead after one summer in Lake Erie is 16”; after two summers 23”; and three summers 25”. Most fish are in Lake Erie two to three summers before they make a spawning run, but a few survive for four or more summers. The total population of steelhead in Lake Erie at any one time is estimated at 800-900 thousand fish. Charter boat – caught steelhead have shown that the fish are feeding on a wide variety of prey in the lake. The primary energy source for steelhead are other fish. Emerald shiner is the major baitfish in the steelhead diet, but so are smelt, round goby and juvenile yellow perch. Round goby invaded the Great Lakes in the last two decades via ship ballasts. While unfortunate, they are providing a significant food source for larger fish. In terms of numbers of food items, insects also make up a significant proportion of the steelhead diet, including terrestrial moths, beetles and Eurasian lady beetles. Spiny water fleas (another exotic invasive species) are also a diet item. However in terms of biomass, these invertebrates are a distant second to forage fish in the steelhead diet. There is no reliable estimate regarding what percentage of the steelhead population in Lake Erie runs up tributary streams to spawn each year. Most fish in the tributaries are 24-26” long, but some are male ,one year old fish, called “skippers”, which average 16”. Movement of steelhead from LE into the tributaries is triggered by increased flow rate in the streams and lower water temperatures. As river temperatures cool to the 50s, bait fish move into river mouths and harbors. Steelhead follow these bait fish and stage off the river mouths in October. Although a few enter rivers in October, most movement into the tributaries begins in November and continues all winter, particularly in times of high stream flow. Regulation of the Ohio steelhead fishery is fairly minimal. Snagging and selling of eggs is prohibited. Harvest is restricted to two fish per day from Lake Erie and the lower tributaries from September 1 through May 15. Fish must be at least 12” in length, primarily to protect recently-stocked fish from harvest. More harvest and size limits have not been necessary because studies have found that most steelhead are released unharmed by Ohio fishers. In the fall of 2008, Ohio Division of Wildlife began a two- year creel survey of the entire Ohio steelhead fishery. Surveyors questioned anglers on the streams about their catch (including released fish), as well as human attitudes including their desire, experiences and what they want for the future. Assessments were made to evaluate the economic value of the fishery to various regions. Data collected in this survey were compared with data last collected in 1984. Results showed that participation in Ohio steelhead fishing had more than doubled, increasing from 124,000 angler hours per year to more than 300,000. Catch rates had also increased from 0.05 fish per hour of fishing time to 0.3 – 0.4 per hour. Total fish caught increased from only 5000 in 1984 to over 100,000 with average length of fish caught ranging from 21.3 – 24.8 inches. A very significant finding was that Ohio fishermen view steelhead primarily as a sport fishery, releasing about 90% of those they catch. This is a major change from 10-20 years ago. The survey confirmed that the steelhead fishery has considerable economic value to northeast Ohio, with steelhead fishers spending about $30 million in the region, mostly on food, gas and lodging and fishing gear. Data showed that people came from about 25 other states and Europe to fish for steelhead in Ohio. Despite current success of the steelhead fishery, there are some issues of concern. The greatly increased amount of information available online has facilitated a much higher rate of angler success and encouraged fishers to key in on certain areas, resulting in high angler pressure at some sites in streams. Lake Erie water quality issues are also important, but recent algal bloom concerns in the Western Basin are not an issue for steelhead since they live in deeper water in the Central and Eastern Basins. Numbers of cormorant have skyrocketed on Lake Erie in recent years. These fish-eating birds do take some stocked fish and ODNR and other agencies are taking action to manage this species. Sea Lamprey wounding of steelhead is also on the rise. This situation has worsened in the last 5 years because so many adult lamprey are now in Lake Erie. This is due to many factors, including water pollution control that has led to cleaner water in the Detroit River and Lake St. Clair. This has resulted in increased lamprey production in those areas that empty into Lake Erie. At present the Grand River and Conneaut Creek watersheds are treated on a three- to five-year cycle with lampricides to kill larval lamprey before they mature and enter the lake. Treatment of other rivers may be needed. This article was prepared by Randy Rowe based on a presentation given by Kevin Kayle at the November 10, 2014 meeting of the CFRTU chapter.